Coming away from a marathon test session at Barcelona, first Jean Alesi in a Prost, then Rubens Barrichello in a Ferrari shattered the track records. To the popular masses, the news of a Prost leading the charge is a real eye opener. 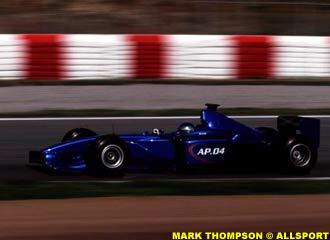 The team came last in the 2000 Championship, with little prospect of improving their lot. Come the new season, and a move to Michelin tyres with Ferrari power appears to have completely changed their lot. Is it any coincidence that six months ago, the team was struggling to find sponsorship for a season of racing ahead, yet they produce spectacular times in the run up to the new season? There are several factors which lead to good testing times. Two years ago, Honda ran what appeared to be exceptional times with a test chassis. Uproar followed on the paddock, as team managers could not believe the team was so competitive when they would not even be taking the grid... they had to be running light. So the FIA updated the rules to insist all cars attending sanctioned tests are compliant at all times. The uproar was due to a very important factor: at this time of year, teams who are short on their sponsorship package for the season ahead have to demonstrate they are worth spending money on � and claiming to be the season's dark horse on the back of strong testing results is top favourite. Seeing Ferrari come back on the last day to beat Jean Alesi's time did not surprise many at the session. The car has been going quicker throughout the test, and the team is the frontrunner, alongside McLaren. Getting the car into qualifying trim to work with the new Bridgestone rubber has been on the cards from the outset � qualifying is a vital part of the modern sport. What was unusual was the timing. Ferrari, like most of the front runners, likes to sand-bag. The normal approach to "qualifying" work is to run at the slowest time of day: in the heat around lunch is top. Leaving new aerodynamic parts off, or taking half a second out with extra fuel in the tank, it also fair game. Saving it to the quick time of day � the "golden hour" before the circuit shuts down. However, this year there is a new game in town: it wasn't just a Ferrari powered Prost that held the top time, it was a Michelin shod car. And in the media ratings, Bridgestone is looking to demonstrate complete dominance of their French rival, so beating the time was of genuine importance. Ferrari obliged, putting Barrichello in last year's car with experimental tyres. It seems a small price to pay for maintaining preferred status with their tyre supplier. As de la Rosa was anticipating spending at least one more year at Arrows, news of his departure came as almost as much of a shock to him as to the public at large � though most of the paddock appeared to be waiting for the news. 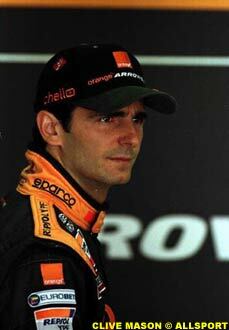 It was known that Repsol and Arrows were still attempting to come to terms for sponsorship in 2001, or at least, it became so when Bernoldi tested in place of de la Rosa at Barcelona. The less well publicised crux of the matter was Repsol's insistence on a "value for money" deal, where they paid according to results. If Arrows lived up to their promises, they would do very well indeed � but few believe the team will make it to fifth on the grid this year, barring miracles. Repsol are not in Formula One for the short term. From their viewpoint, Arrows have told them that this year the car is a solid performer, and should bring home points galore. If this is not the case, then Repsol should not be footing a front of the grid bill for an underachiever. However, conversely, if the team have produced, they are worthy of solid investment, in order to provide for growth and better prospects next year. Rewarding results with the prospect of better results is good business sense, and an incentive to make the relationship honest. 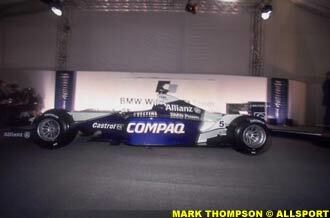 Following the test at Barcelona, BMW are worried � they are getting through too many engines by half. Now is certainly the time to be discovering all the shortcomings of the unit � better to lose miles in testing than races, that's for sure. However, the problems are coming in a lot quicker than expected, and in more areas. The pre-season program has been ambitious � BMW are looking for a good step forward, as the team pushes to close the gap. Honda is backing two strong rivals in BAR and Jordan, and seems to be a real threat. Add the pressure of appearing to be second to Mercedes, and the imperative for a strong engine is manifest. Unfortunately, the quest has put tolerances right to the theoretical maximum, and like Mercedes ahead of them, BMW designed with traction control in mind. The latest spate of problems arose after successful tests with the post-Spanish Grand Prix system operable. Increased strain on the drivetrain from wheelspin, and the driver's actions to recover from it, has proven damaging to stressed internals. Work on engine mapping to smooth the curve is proving inadequate, which leads BMW towards the need for beefing up critical internal components. However, with the Australian Grand Prix looming, the clock is definitely ticking on that one.